On Sunday Ivan and I came across an antique market and decided to check it out. There were a bunch of different barns all filled with cool things. Unfortunately we got there just a few minutes before 4...and it closed at 4, oops! Oh well, now we're looking forward to checking it out some other Sunday. However, Ivan and I did pick up one thing each. Ivan got a stein to add to his collection and I got this adorable camera, I just can't resist mint coloured things! So much fun! Have you found anything good lately? ohh man that camera is the cutest! i came across some cameras at a antique market this weekend too, but not nearly as many! or as cute at the mint one! what a super cutie camera!! I'm a sucker for a ll thing mint colored too- even ice cream! Awesome camera! And wooaaaah that shelf! I love the mint camera! Would you mind sharing the location of this fabulous antique market? 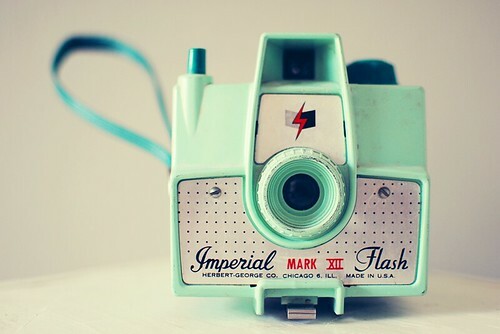 I have that same camera and I love it! What a great collection of cameras they have! Check out my new vintage shop! I can't resist mint either. What a cute, little guy. Oh my, that is quite delightful ! Look at all of those fun cameras! Wow! There's just something about old cameras that makes me warm and fuzzy inside. I especially love the mint-colored one you picked up. Great find! oh it's so cute! i love it! i wanna see what kind of pictures it takes! that is adorable. i love the look of old cameras. i actually found a cool mirror that has a box attached to it at an antique store here in town. i'll have to go back and ask the price. That is a glorious camera collection. I want them...All. danielle & anonymous - let's keep everyone happy...email me danielle and I"ll tell you!! ;) anonymous, email me too! i want to know which one you think it is!! joy, me too! i might try to get some film for it...or i may just use it as decoration. it is so pretty! Love all of the cameras & the mint one is adorable! I recently found 3 older mason jars, 2 great dresses & a friend of mine gave me a light up globe lamp to add to my collection! Ohmygoodness - I'm super-jealous of that camera shelf!! Eeek! :) Love yours! Our thrift shops here never seem to have any cameras - I always find lovely bright plastic knitting needles and plant pots, lately - lol. THAT CAMERA RULES! Does it work? If so, please please please post pictures from it. I bet they turn out really cool. OMG, your camera is fantastic! Nice color! I just randomly came across this post and I really hope it's not where I think it is! I had so many opportunities to go there when I still lived in the area and never took them. I guess I didn't think antiques were cool back then or something? So naive!